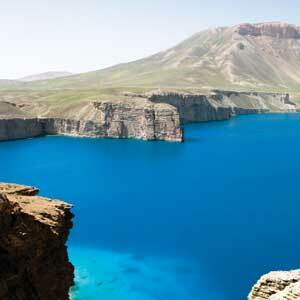 The Band-e Amir lakes are one of the most popular tourist destinations in Afghanistan. The Hazara people believe Ali, a relative of the Islamic prophet Muhammad, miraculously created the lakes to convince a tyrant king to release a poor, imprisoned family. In the southwestern stretches of the Hindu Kush mountains of central Afghanistan, approx-imately 215 kilometers west of Kabul, sits an extraordinary series of chilly, jewel-toned lakes that shimmer as bright as swimming pools. Known collectively as Band-e Amir (Dam of the Ruler), their vibrant blue waters are a visual oasis from the gray, rocky mountains that border their shores. The rural villages dotting the rugged landscape are home to the Hazara people, who hold the waters as sacred, the sight of a miracle. 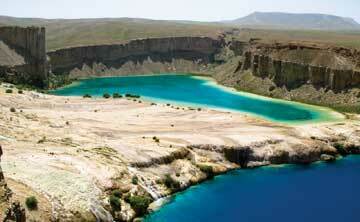 These sacred lakes sit along the Band-e Amir River, formed from a series of natural travertine dams. Beginning in the east is the largest lake, the 6-kilometer-long Band-e Zulfiqar (Dam of Ali’s Sword). To the west, slightly below the terraced walls of Band-e Zulfiqar, is the small, turquoise Band-e Pudina (Mint Dam), its shores surrounded by wild mint, green shrubs and trees. The stand of trees around Band-e Pudina gives way to the chalky white banks of the next lake, the Band-e Panir (Dam of Cheese). Water from the Band-e Panir then flows into the Band-e Haïbat (Dam of Fear). Historically, to the west of Band-e Haïbat existed two shallower lakes, Band-e Kambar (Groom’s Dam) and Band-e Ghulaman (Dam of the Slaves). Recently, however, French geologists noted these lakes had disappeared, perhaps the victims of seismic activity that damaged the lakes’ travertine dams, allowing their water to drain. On the shore of the Band-e Haïbat sits a white shrine dedicated to Ali, cousin and son-in-law of the Islamic prophet Muhammad, built by the local Hazaras in 1904. The Shiite Muslim Hazaras believe Muhammad designated Ali as his successor. Their shrine commemorates one of Ali’s many miraculous acts, creating the Band-e Amir lakes. Over the years there have been slight variations in the details of the Hazara legend about Ali’s efforts to make the lakes, but the core of the story has remained the same. Hundreds of years ago, an oppressive, tyrant king who ruled the region imprisoned a man’s family because the man could not afford to pay the king’s tariff. Not knowing what to do, the man sought the help of Ali. Being both clever and wise, Ali hatched a plan: The man would offer to sell the disguised Ali as a slave to the king in exchange for his family, claiming the slave could do whatever the king requested. Thinking of what seemed to be an impossible task, the king demanded the slave construct a dam to stop a flooding river. With the might of his sword, Ali cut into a mountainside. The falling rocks formed the sword-shaped Band-e Zulfiqar, but this did not stop the flooding river. Next, Ali dug up trees and shrubs to build Band-e Pudina, but the river continued to flow. Ali then asked local women to bring him cheese that he placed in the water to create the white-muddy-bottomed Band-e Panir, but this still did not hold back the flood waters. In a fit of fury, Ali hurled rocky boulders at the flooding river, forming Band-e Haïbat. With this last dam, Ali was finally successful in stopping the flood. Upon completing his task, Ali revealed his true identity to the king. Amazed by Ali’s miracle, the king converted to Islam on the spot. The Hazara story of how the Band-e Amir lakes formed is enchanting, but it is different from the one geologists tell. In the 1970s, John (Jack) Shroder, a geologist at the University of Nebraska in Omaha, began studying the lakes’ geology. But after the Soviets invaded Afghanistan and a communist regime took hold, Shroder was deported. This ended his study of Band-e Amir, and he never returned; however, he hasn’t forgotten the lakes’ beauty or what he learned about them nearly 30 years ago. The turquoise color of the Band-e Panir, or Dam of Cheese, is due to minerals in the lake’s waters. Shroder says Band-e Amir’s waters are full of minerals, which give the lakes their brilliant blue colors. In particular, the lakes contain dissolved calcium carbonate. When water carrying calcium carbonate gets agitated — as might happen when water flows over a dam or down a waterfall — it releases carbon dioxide. The release of the carbon dioxide causes the calcium carbonate in the water to solidify, forming travertine rock. This process, Shroder says, is “self-perpetuating.” The formation of the solid travertine further agitates the water flowing over it, causing the release of more carbon dioxide, which then causes the build up of more travertine. In the Band-e Amir River, this buildup of travertine dammed the river, creating its lakes. Today, water continues to flow down waterfalls over the sides of these travertine walls. Shroder says this process probably began sometime during the past 10,000 years or so. The likely culprit behind the water’s initial agitation, he suggests, could have been a landslide downstream. Afghanistan, lying atop the Eurasian Plate not far from the plate’s boundary with the Arabian and Indian plates, is no stranger to seismic activity (see Geotimes, February 2002). Françoise Bourrouilh-Le Jan, a geologist at Université Bordeaux 1 in Talence Cedex, France, who has studied the lakes with his colleagues, suggests in the recent book Myth and Geology that the Hazara legends of the lakes, in part, serve as a warning to the area’s inhabitants: The anger and fury Ali displays in the Hazara tale could represent the seismic activity in the Hindu Kush region. Regardless of their origin, the Band-e Amir lakes stand as one of Afghanistan’s most awe-inspiring wonders and have traditionally been one of the country’s top tourist destinations. In 1973, the Afghanistan government recognized this when it declared Band-e Amir a national park. Unfortunately, the government never officially ratified this into law. Despite receiving no formal protection from the government, these pristine lakes continue to survive in the heart of Afghanistan. 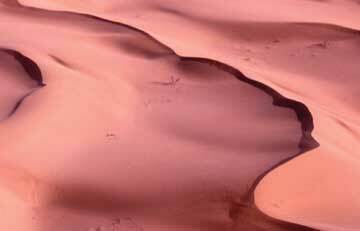 The Rub’ al Khali, or Empty Quarter, is a vast desert in the southern part of the Arabian Peninsula. One of the most inhospitable places on Earth, it has remained largely unexplored until recently. Sometime around 2,800 B.C., the ancient city of Ubar rose out of the sands of Arabia and became a wealthy center for the trade of a highly prized sweet-smelling resin called frankincense. For about three millennia, legends say, the city flourished as part of the ancient Incense Trail that linked Arabia, Egypt, Babylon and Rome. Then, sometime around A.D. 300, the city abruptly disappeared. Over the ensuing centuries, stories of a once-great city swiftly buried by the desert took on a mythical quality. The name of Ubar was associated with several such fabled cities, although they may not have all been the same, and was referenced in several sources. In Bedouin legends and the Arabian Nights, the city is called by the Arabic name Iram, or Iram of the Pillars (it is also called “the lost city of brass”). Ubar/Iram also appears in the Quran, which says it was a sinful city inhabited by the people of ‘Ad. According to the Quran, the city met its fate when its denizens rejected the prophets of Allah. Ubar was then destroyed for its wickedness by a furious wind, a sandstorm that swallowed the city whole. (In Arabian Nights, the city came to a similar cataclysmic end.) A 13th-century Persian historian, Rashid al-Din, turned the story of Ubar into a cautionary tale: Ubar was originally created as an imitation of paradise, he wrote in his Islamic history Jami’ al-Tawarikh, but due to its sins, “a great wind and a terrible noise” destroyed the city. From that time forth, he wrote, Ubar belonged to “evil creatures, each with a single arm, leg and eye,” and travelers who ventured too close would go mad with fear. By the early 20th century, however, explorers and adventurers began to wonder whether the lost city of legend might actually be real. Ancient Greek authors, including Herodotus and Pliny the Elder, had written of cities that traded frankincense and myrrh in the desert of southern Arabia. T.E. Lawrence (Lawrence of Arabia) called the vanished city “Atlantis of the sands” in his 1926 book Seven Pillars of Wisdom and hoped to discover it, although he died before he could fulfill his ambition. The Rub’ al Khali, or Empty Quarter, in southern Arabia is a vast sandy desert of towering dunes and scorching temperatures that covers 650,000 square kilometers, including parts of Saudi Arabia, Oman, Yemen and the United Arab Emirates. It is one of the most inhospitable places on Earth, and as a result, is rarely explored. One of the first Western adventurers to venture across it was British explorer Bertram Thomas in 1930. During his expedition, Thomas found a caravan track about 100 meters wide that his Bedouin guides referred to as the “road to Ubar,” telling him that that the ruins of a wealthy city, now buried beneath the sand, lay a few days’ travel to the north. Twenty years later, in 1953, an American adventurer named Wendell Phillips followed Thomas’ trail and found the caravan route, but still could not locate the city in the desert dunes. The advent of remote sensing gave modern-day explorers a new way to scan the desert’s forbidding sands, however. In 1982, the NASA space shuttle’s imaging radar system demonstrated that it could penetrate below dry sand, detecting ancient rivers and streams buried beneath the flat desert of southern Sudan. In 1983, filmmaker and amateur archaeologist Nicholas Clapp became intrigued by the possibility of spotting traces of the ancient city buried by the desert from space — but the question was where to look. Poring over Thomas’ account of his travels, as well as a 2nd-century map of the area by Greek geographer Ptolemy (who had given the entire region the name of Ubar, rather than a single city), Clapp was able to determine a general location. He then enlisted the help of NASA scientists, including geologist Ronald Blom of NASA’s Jet Propulsion Laboratory in California. In 1984 a space shuttle flight equipped with imaging radar took aim on the Empty Quarter. From these images, as well as images from Landsat and the French SPOT satellite, Clapp and Blom detected the geological traces of ancient caravan tracks, with the finer, well-worn grains in the tracks appearing lighter in infrared images than the larger sand grains of the surrounding desert. The tracks, they found, crisscrossed the desert and converged like the spokes of a wheel on a small village known as Ash Shisr, at the edge of the Empty Quarter in Oman. In 1991, a ground-based team led by Clapp and including Blom, archaeologist Juris Zarins of Missouri State University in Springfield, Mo., and British explorer Sir Ranulph Fiennes, set out to investigate and, eventually, excavate the desert around Ash Shisr. Near the village were meter-high ruins in the sand, which had been noted by earlier explorers, but were thought to be the remains of a fortress only 300 years old. Over weeks of digging, however, they uncovered eight 9-meter-high towers connected by thick, 3-meter-high walls that marked the outline of an octagonal-shaped fortress city. They also found pottery fragments from as far away as Greece, Rome and Syria, some dating as far back as 2,000 B.C., suggesting that this city, whatever its name, had once been a major trading center. The excavation had revealed that an ancient city and center of trade was more than myth, and had indeed been buried in the sand, although whether the excavated city was Ubar and/or Iram is still unclear. The site also revealed an answer to the puzzling question of why the city had disappeared so suddenly. The city the researchers uncovered had indeed met a cataclysmic fate. Its walls had been built above a huge limestone cavern, which provided water to its inhabitants and to travelers preparing to cross the desert. As the people withdrew water and depleted the aquifer, however, the roof of the limestone cavern collapsed under the weight of the fortress. Rather than a sandstorm, or a great wind destroying it from above, a giant sinkhole had swallowed the lost city. Later archaeological expeditions to the site in the 1990s, led by Zarins, continued to excavate the fortress city. The city’s name remains in doubt, however. In a 1996 interview with PBS, Zarins noted that the historical sources, including Ptolemy’s map, use the name “Ubar” to refer not to a city but to a group of people and a region — and in fact, there may be several other such trading centers buried in the sand along the ancient caravan routes. Regardless of whether it was the exact city of the legends, he said, the team had indeed found a lost city of Ubar. 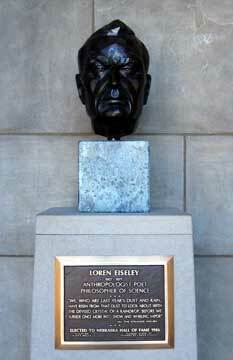 Though Loren Eiseley spent most of his professional career as a professor at the University of Pennsylvania, he is also memorialized in the Hall of Fame in his home state of Nebraska. I sometimes ask my colleagues and friends if they are familiar with Loren Eiseley’s writings. I find that many have not even heard his name. Eiseley has been my favorite essayist for years, and I regret that he is now largely forgotten by scientists and the public, and most of his books are out of print. This is unfortunate, as Loren Eiseley illustrates a vital bridge between “the two cultures”: the natural sciences and the humanities. His thoughts and writings as a human paleontologist, archaeologist, teacher, nature watcher, essayist and poet also offer a way out of two confining camps — on the one hand, extreme materialism denying anything spiritual that cannot be explained by scientific terms, and on the other, blind faith rejecting anything scientific that’s at odds with literalist perception of scriptures and myths. Eiseley’s vision is down-to-earth, not arrogant, and embodies both reason and heart, without sacrificing one for the other. Eiseley was born in Lincoln, Neb., 100 years ago this month, on Sept. 3, 1907. His father was a hardware salesman with a passion for Shakespearean literature, and his mother was deaf and an amateur artist. His family was not wealthy, and by historical accounts, his parents apparently did not have a happy marriage. With their house located on the edge of town and facing the open plains, the young Eiseley took refuge in nature and enjoyed being alone and a wanderer. The title of Gale Christianson’s biography of Eiseley, Fox at the Wood’s Edge (1990), vividly captures this early-formed and lasting character of Eiseley. With 36 honorary doctorate degrees awarded to Eiseley by various universities, he was the most renowned member of the University of Pennsylvania since Benjamin Franklin. (Incidentally, Eiseley held the Benjamin Franklin Professor-ship.) From the perspective of the history of literature, Eiseley was heir to Emerson and Thoreau. But Eiseley’s knowledge of science surpassed both of them; moreover, Eiseley is a century closer to us, and he had seen the horrors of two world wars, which influenced his perspective and still resonates with us. Eiseley’s first collection of essays, The Immense Journey, published in 1957, established him as a poetic nature writer who blended humanism and the search for spiritual meaning with natural science. This was followed by several other successful books (see sidebar). As a spiritual and nature writer, evolution was a topic Eiseley revisited in several of his works. Eiseley considered evolution not merely a scientific subject to be limited to school textbooks but a grand scheme and process in nature which connects us in blood, body and mind to the rest of the planet. To him, there was more heart, humility and humanity in an evolutionist perspective than in the belief that a heavenly father had created everything independently and out of nothing, and all of life for the service and pleasure of one species: us. Darwin’s Century, which won the first-ever Phi Beta Kappa award in science writing, still remains one of the best expositions of Charles Darwin’s discovery of evolution to the public. But in his book, Eiseley did not shy away from challenging the anti-humanist and deterministic interpretations of “social Darwinists.” He concluded his book with the idea that life in general, and the human species in particular, has brought about the idea that changes in matter are not determined by or predictable from antecedent causes, and that the human mind is “a reservoir of infinite possibilities of good and evil.” Although material development and the extension of our mind into the power of machines cannot be denied, such developments in the absence of morality are not necessarily good or desirable, for us or for the planet. “The enormous wealth now poured by modern governments into the implements of war,” Eiseley warned, “reveals a kind of leviathan echo from the Age of Dinosaurs.” Evolution has also made “an interior kingdom in which man is forever free to be better than what he knows himself to be.” It was in this “inner galaxy” (the title of another of his essays) that Eiseley placed humanity’s healthy dreams of lasting progress and true happiness. In his essay “Science and the Sense of Holy,” Eiseley showed how science can find sacredness in nature and in its work. He expounds on three notions in this work — natural evolution, marvel and compassion — that form the basic ingredients in the web of his thoughts, stories and writings. He noted that the evolution of life on Earth makes all nature one interconnected family — or, as Darwin said: “We may be all netted together.” Furthermore, he posited that we gain a deep feeling of awe, wonder and marvel from reflecting upon nature. He also discussed how the spiritual and mysterious in the human mind are neither psychological defect nor supernatural, but a part and parcel of human nature, which in the true state (when not misguided) can lead to profound qualities of wonder and compassion. We should treasure these meanings. Eiseley acknowledged that words cannot adequately describe the ever-flowing interconnected processes of our deep insights and feelings. He calls this situation “the Cosmic Prison” (the title of one of his essays) — an invisible world of prisons within prisons that we create through our limiting words, our need to define everything in clear-cut terms. This situation, he agrees, is not intentional but out of necessity for communication. Nonetheless, one should be aware that as “prison keepers,” we force realities into names and terms — black versus white, for example. Add to this “invisible prison” the vast expanse of time of the universe and the short span of human life, and you have to wonder how we can claim to be “the masters of the universe.” There is much more in the world than meets the eye, and much more in our life and mind than can be verbalized. Sorkhabi is a geologist at the University of Utah in Salt Lake City. E-mail at: rsorkhabi@egi.utah.edu.